If you often use a baitcasting reel, chances are good that you experience backlash on occasion. No matter how careful you are, it can happen at the worst time. Backlash, when the line tangles at the reel, is one of the biggest headaches in angling and it can waste precious time on the water. The typical response to backlash is to start pulling at the tangled mess of line in your reel. Unfortunately this often makes the situation worse. From there, many anglers resort to cutting line out of there reel. Fortunately, there is a solution that is easier and less time consuming that will clear your backlash and have you back casting baits. The most important thing to avoid when trying to fix backlash is the temptation to pull at the tangle on the spool. This will only make things worse. Instead, press your thumb firmly on the spool. With your other hand, turn the handle one turn. This helps to get the tangle in line on the spool. Next, press down on the thumb bar and try pulling the line off the reel. The line may only come out an inch or two on the first try. If so, continue the above steps and gradually the backlash will come out of your reel and you will be back in business. Of course a quick solution for fixing backlash is nice, but it would be even better to avoid backlash all together. Reel manufacturers are producing better anti-backlash technology all the time, but it is not perfect. 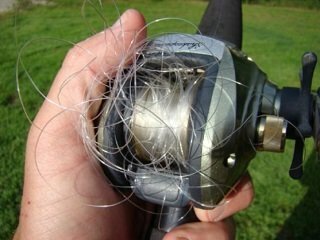 The real key to avoiding backlash is to properly setup your reel and to practice casting before you hit the water. Take your rod and reel out to the backyard and tie a ½-ounce weight to the end of your line. Hold the weight off the ground and begin slowly loosening the spool tension control knob on your reel, until the weight starts to fall toward the ground. Next, tighten the spool tension control knob one-half turn. Now try casting, without your thumb on the spool. If you get backlash, use the above tip to remove it. Tighten the spool tension control knob slightly and repeat until you do not get backlash. At this point, you are avoiding backlash, but your casts will not be very long, because the spool tension control knob acts as a break and reduces the length of your casts. Here is where practice comes into play. Slightly loosen the spool tension control knob and try casting again. This time, lightly press your thumb on the reel to get the feel for it. Continue gradually loosening the spool tension control knob and casting until you can make normal distance casts, without any backlash. Ideally, you will be able to cast with the spool tension control completely loosened. This will allow you the maximum distance in your casts.